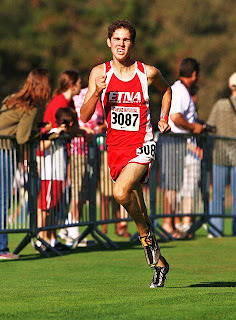 Today we chat with the 6th fastest overall runner (15:23.9) from yesterday's Stanford Invitational, John Whelan of Etna HS. He was the Northern Section champion last year in cross country defeating runners from Divisions 1-V. He went on to finish in 7th place in Division V at the state cross country meet and is the 2nd fastest returner from that division behind only Connor Clark of University HS (2nd place finisher). During track season, Whelan finished in 2nd place in the 3200m. at the NS championship meet, running a lifetime best time of 9:28.20. This past summer, Whelan attended the Steen's Mountain Running Camp once again and broke the uphill 5k record formerly held by Ian Dobson of Klamath Union (also Stanford grad now). 1) What other sports have you played besides XC and TF? I played basketball in junior high through to my freshman year; I've always been hopelessly uncoordinated so I gave up basketball and switched my focus to running year round. 2) How did you get your start in running? I got started in running thanks to a very active P.E. program at my junior high. We'd run a timed mile every week, I loved seeing my times drop and have been hooked on the sport ever since. 3) What was the first success that you remember in running? My first real success was my first track meet of my freshman year. I broke 5 minutes in the 1600m which was a big barrier for me at that time and I ran it over 30 seconds faster than I had run the year before. Though I had much greater successes that season and the years afterwords, that race really redefined what I thought of myself as a runner. 4) Tell us a little about your freshman seasons in both sports and some of your highlights. Freshman year of X-country I was really just discovering the sport since my junior high had no X-country program. I ran well, but didn't make it to state or do anything else substantial. Track is where my first success came; I made a huge improvement during the season, and finished it with a 10:13 3200m that broke my school’s frosh-soph record. 5) What about sophomore seasons? Highlights? Riding the success of the last track season, I made big improvement s during my sophomore X-country season. I became competitive in our region and placed 33rd in D5 at the state meet with time of 17:00. Through the winter I put in the best training I ever had done instead of playing basketball. I dropped my track PR’s to 4:32 and 9:37, and placed 2nd in the 3200m at the NSCIF finals. 6) Did you change anything during your summer before your junior season in XC? What Training wise, what do you mostly do during the summer? My training wasn't anything special, bu my mindset started to change. My summer before junior year I actually had to only workout on a bike for 3-4 weeks in the beginning because of some foot pain that I didn't want to advance into a serious injury. I still got 2 months of running in and attended Steens Mountain Running Camp in Eastern Oregon. The camp was a great experience, they had an uphill 5k race during the camp that gains about 800ft of elevation which I won against some top runners from multiple northwest states. It gave me the confidence to run against anybody. 7) Highlights for your junior seasons in XC and TF? Junior year of x-country was a breakout year for me that really started with winning the D5 race at Stanford. I won the NSCIF cross country meet which has all divisions combined. I improved my place at state to 7th with a 15:53, though I felt like I didn’t run to my full potential that day. I definitely learned a lot that season. I had a solid track season, but lost the NSCIF 3200m by 1 second and missed qualifying to state (in the north section only the section champion in each event qualifies for state). 8) What are your current PRs on the track for 800, 1600 and 3200? My current PR’s in track are 9:28 for 3200m, 4:24 for 1600m, and 2:05 for 800m. 9) What does a typical week look like for you now during XC season in terms of workouts, long run etc? Over the summer I ran consistently about 52-58 miles a week, with a lot of quality sessions. During this season I’m running the same mileage as the summer, with usually 3 workouts a week, a race, and then mileage to fill the other days. In terms of workouts we run a wide variety of stuff: hills, tempos, fartleks, and intervals –I don’t usually do a specific long run. We usually focus on developing one system each week (strength, speed, etc…) in a cycle that revolves around important meets. 10) How much traveling do you do during the season in order to compete against some of the best runners in the state? Not a whole lot. We’re doing a little bit more traveling this year because most of my top competition locally were seniors last year. We went to the Northwest Classic in Eugene that had some of Oregon’s top runners as well as the Stanford Invite, but other than that we’ll compete locally until the state meet. 11) Favorite long run? Favorite XC meet/invitational? 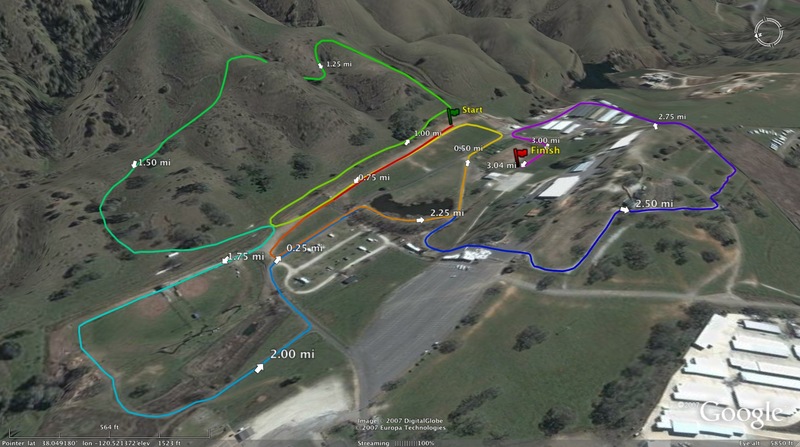 Favorite XC course? Favorite XC workout? Favorite track event? Favorite track invitational? Favorite track workout? Favorite opponent(s)? I’m not sure I can name a favorite run, I live in a rural mountain valley that has so many great places to run. Behind our school we have a lot of hilly dirt-roads and trails, and I live only a 3 mile run away from a summer camp that has some great roads and trails. Favorite XC course- Lithia park in Ashland, OR; and our section championship course at West Valley. I like challenging courses. Favorite XC workout -Mile repeats or tempos, they tell you a lot about your current fitness. Favorite track event –I think the 1600m is the most fun but I’m better at the 3200m. Favorite track invitational -West Valley/Oroville invite. 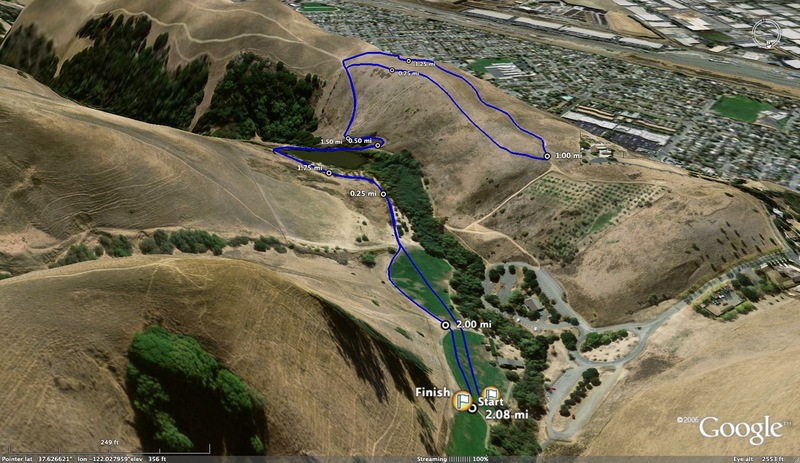 Favorite track workout -we do a workout that has multiple sets of hills and 300m repeats, it's brutal but has a lot of variety and makes us strong and fast. Favorite opponent(s) -Tony Meredith of Foothill High School (Palo Cedro), he graduated last year but we’ve had some epic battle both in track and xc! It also always a blast to train or race with the Yreka guys (2011 D4 state xc champs), and I love racing and meeting new people at big meets as well! A big thanks to the coaches, teammates, friends, family, and community members that have helped me get to where I am now. Even when running as an individual, x-country is not an individual sport. I couldn't accomplish what I have without so much support. While I crunch the numbers, feel free to discuss the outcomes of today's Stanford Invitational races. Who was most impressive today (teams and/or individual)? What was the biggest surprise? Who are the NorCal teams ready to compete for a podium finish at the state meet? What else? More will be added as I find it. Now we know who is racing who. What are the best match-ups on Saturday? Teams? Individuals? 2 teams from Northern California ranked. Who else will join them later in the season? Just as a reminder before the Stanford Invitational tomorrow. How will they stack up against each other on the same course. I do understand that some races may have better conditions than others. Please feel free to comment on the rankings below. Keep up mind that the season is early and many teams have not fielded their "A" team yet. What teams that should be considered and added to the lists below? Who should move up? Who should move down? Who should move out? Feel free to chime in the comment section below. Again, comments are welcome. I want to make the above lists as accurate as possible before we head into the league competition and the Stanford Invitational. 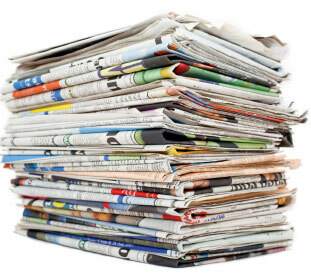 Any other articles pertaining to the Stanford Invite? 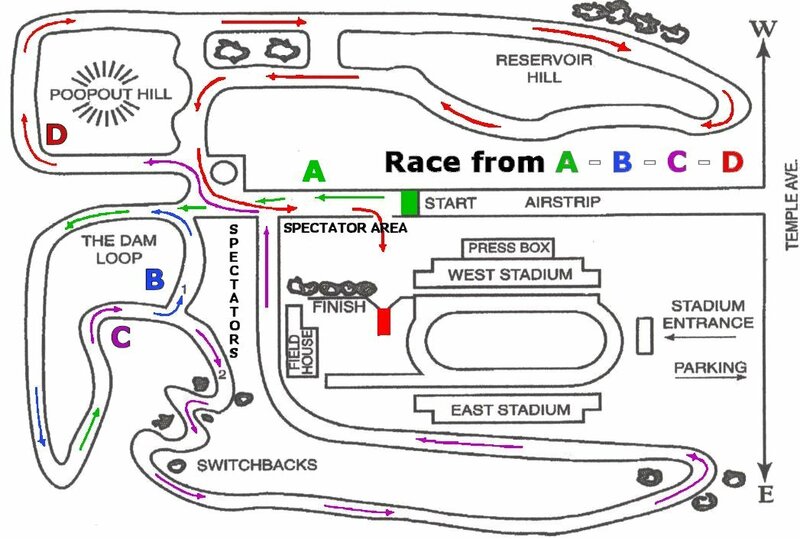 What is going to be the best race? Who is going to be the fastest boy from NorCal? Fastest girl? Fastest teams (boys and girls)? Local Roseville High School Phenomenal student athletes, Neilson (sophomore) and Shayna Powless (recent RHS grad, currently attending UCLA) both qualified for World Championships XTERRA to be held in three weeks. Neilson earned his second consecutive Championship National Title in the 15-19 age group, but was also the first amateur finisher amongst the professionals with his 12th place finish overall. 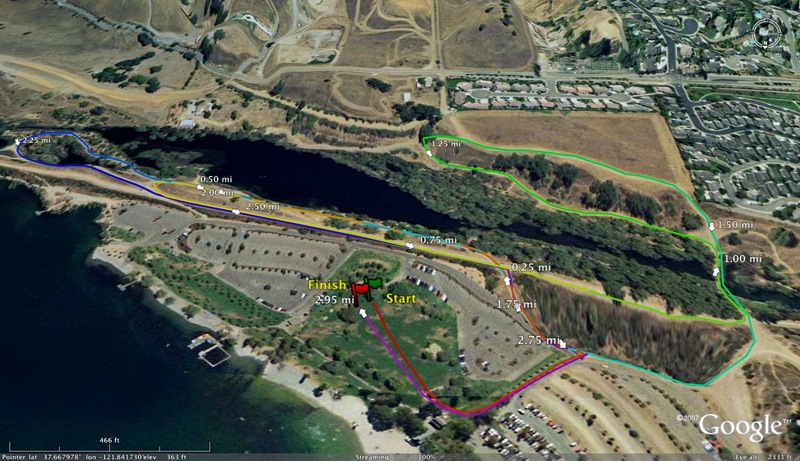 He also won all three of his XTERRA qualifying races including Incline Village, Portland and Lake Tahoe as the youngest competitor. His overall champion/finisher in all three races (including the professionals), was exceptional for a then 15 year old. 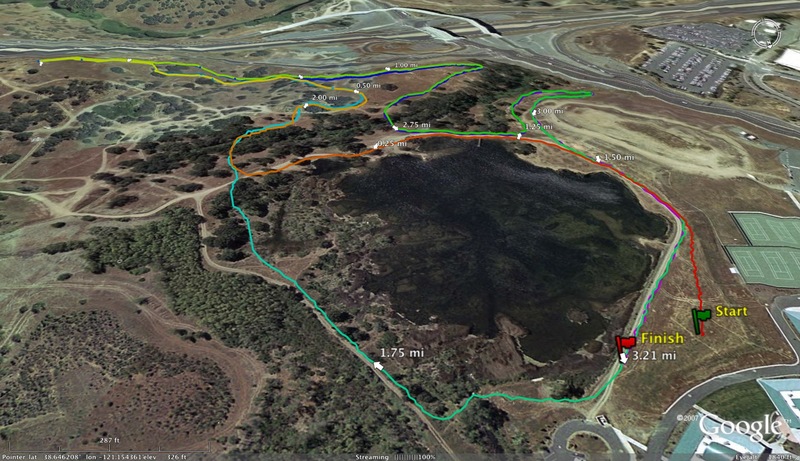 He continues to juggle racing X/C for Roseville High School with triathlons, while posting some new meet records, and overall best times, in cross country including the Folsom High School 3 mile course in 15:23. His sister, Shayna finished 2nd at XTERRA Nationals, after a full summer of traveling and representing the U.S.A. Olympic Jr. Team in Europe (where she finished an amazing 2nd in the Swiss Trophy and 3rd in the Belgium Cup). Then she represented her Bike Team BMC by finishing 2nd in New York in the Windham Cup, 2nd in the World Cup before earning two silver medals at UCI National MTB Champs. in Idaho. She was second in both the MTB X/C and super D in addition to 5th in the short track combined ages. Next, Shayna will compete in her first collegiate bike race representing UCLA this weekend in Reno, Nevada. 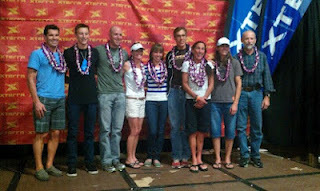 Good luck to the “Powless Siblings” in XTERRA World Championships on Oct. 27th in Maui, Hawaii. I just wanted to publicly thank those of you that have donated money to this site through the link on the right. It's very much appreciated. I try my best to keep the costs of this site to a minimum but time is money after all and there are expenses that go along with hosting a website. Your contributions are always welcome. As he thinks about a lifetime of running, Mill Valley's Connor Clark can clearly recall when he knew that his feet were his path to athletic success. The "aha moment" came as a sixth-grader when, competing for Mount Tamalpais School, he set school and CYO records while winning a 1,600-meter race. "That was basically my first taste of victory, and ever since then I've loved it," Clark said. "I broke my own school record again in seventh grade and again in eighth grade. Ever since then, I've felt I have had a taste for it. 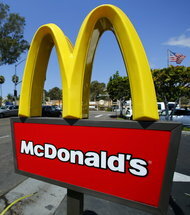 I'm hungry for success." Mill Valley's Connor Clark is vying for a state cross country title in his senior year at University High in San Francisco. (University High photo). cross country team. Clark finished second in the Division V field in the state meet last year and is back in 2012 with the goal of going out that finish one better. Ghebray Invitational Results (NCS) NEW Just added! Farmer Invitational at Hayward HS (NCS) Will be posted once I get them. Any other league results, send them to albertjcaruana@gmail.com. Entries of all teams will be posted in the next few days. What race are you most looking forward to in this meet for teams and/or individuals? Who is going to be the biggest surprise? They are listed in alphabetical order. It's still way too early to rank them but had to get a list going. Who's missing? Who's the fastest boy? Who's the fastest girl? Comments? http://espn.go.com/video/clip?id=espn:8393175 (Titled Jack's Heat-well worth checking out if you want to be inspired). Thank you again for attending the Scott Bauhs Invitational yesterday. Thank you also to those of you who have provided feedback yesterday. We will consider all of it when planning the 2013 edition of the meet. Over the summer we put together a top performances list at the meet and have updated it from yesterday's races. The lists are 100 deep overall and 30 deep by class. Despite imperfect conditions yesterday, we saw meet records in a couple of races as Dominique Regalado of Trabuco Hills set the junior girls' record in 17:52 (#3 overall) and Amador Valley's Jena Pianin broke the senior record and meet record running 17:38. Megan McCandless of Granada and Christine Bayliss of San Ramon Valley were each #2 in the freshman and sophomore races. Despite the warm conditions, the races proved to be deep as there were 20 revisions to the boys' all-time top 100 list and 27 revisions to the girls' top 100 list in the 7th year of the invitational. We want to invite you once again to chime in with an opinion if you have one and haven't shared it yet and we hope you all decide to put our meet on your schedule again next year." As before, I will list the top 10 boys and girls teams in Northern California (NS, SJS, NCS, CCS, SF and OAK sections). I will also list 15 addition teams as honorable mention. Feel free to start naming the teams that should be listed regardless of divisions. Who are the top teams? What is the best boys' team in NorCal? How about girls? Who is missing? Who should move up? 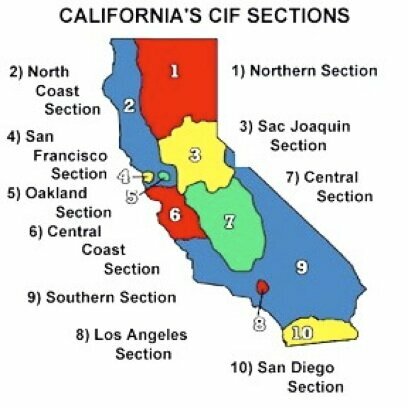 What NorCal team has the best shot of winning state? Now is your chance to rep Nor Cal with this exclusive tank designed for all the runners who proudly compete in NCS, CCS, Sac Joaquin or the Northern section! Everyone knows real cross country running takes place up North (*Bonus points to anyone seen reppin' the shirt @ Mt Sac or NCAA regionals this year). Shirts are limited edition and only available for purchase for the next 2 weeks for HS and Collegerunners.Get your teammates on board & order in bulk to save on shipping. Shirts are super-soft american apparel neon yellow and come in unisex sizing. Today we chat with Northgate HS senior, Danny Stalters. So far this season, Stalters won the Monte Vista Invitational breaking the previous meet record by Monte Vista's Mike Roderick from 2008 (Roderick was NCS Division I champion that same year). He finished 2nd at the Ed Sias Invitational behind Miramonte's Tyler Hanson. At the recently concluded Iolani Invitational, Stalters defeated a slew of Palos Verdes runners (defending state meet champions in Division III) to take the individual title. Progressing nicely from his freshman season, Stalters ran 17:00 minutes at the Hayward HS course at NCS as a frosh, followed that up with a 16:00 minute effort as a sophomore and improved upon that last year with a 15:30, 9th place effort. He is the fastest returning runner in Division III (Jaime Silva is now in Division IV). 1) What sports have you played besides cross country and track and field? I used to play soccer when I was in middle school. My dad used to run when he was in high school and college so it seemed to follow that I would too. There was a track team at my middle school and the first year I was eligible to run I did. 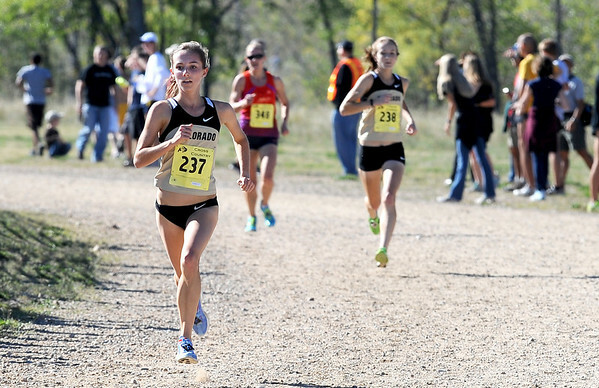 3) Tell us a little about your freshman season in xc and track. Highlights? My freshman seasons were occupied with running like crazy in an overly optimistic effort to keep up with the faster guys. The best part of either season was taking road trips with the team to various races. Two that stick out were the Nike Cross Nationals and the Mt. Sac Relays. 4) How about your sophomore seasons in both sports. Highlights? I was the #1 guy on our squad that year for both XC and track. Because of that, I became somewhat of a leader for the varsity guys as far as advice went. That meant a lot to me. The best part would have been getting the last qualifying spot for the State Meet in cross country. 5) Where do you feel like you transitioned to a level that you felt you could contend with the best runners in the section? I think that happened junior year. I just started doing well against the top competition. 6) What did you do differently during the summer before your junior xc season? Highlights from your junior seasons in xc and track? I ran a lot more. I was doing morning and evening runs in order to double my summer mileage. I think winning league in XC both as an individual and a team was the best part. That hadn't happened in a long time. In track, I PR'd in the 1600, 800, and the 400 in one meet. That was a great feeling. 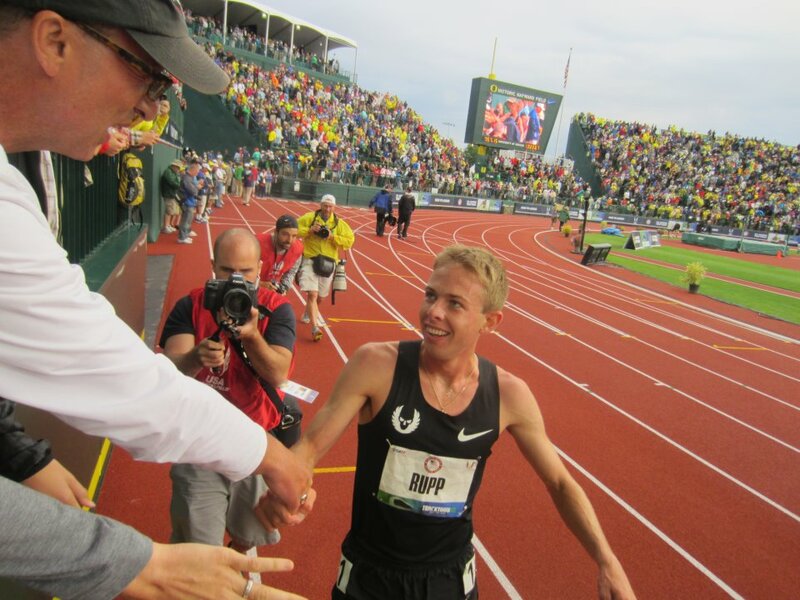 7) Tell us a little about your coach and how he has helped you develop as a runner and person? Any funny stories you can share? Coach Brewer is a terrific coach. He has taught me that nothing comes without a lot of work. But he makes it very clear to you why you are doing the work and doesn't just expect you to do it without a reasonable explanation on his part. It is a very transparent process. Almost every day is a funny story. But the best are when we get him to start ranting about politics. 8) What does a typical week look like for you with a Saturday Invitational during xc? Morning runs? Length of long run? Strength/Weights work? 9) What are your current track prs? 10) Favorite distance training run? Favorite workout? Toughest workout? 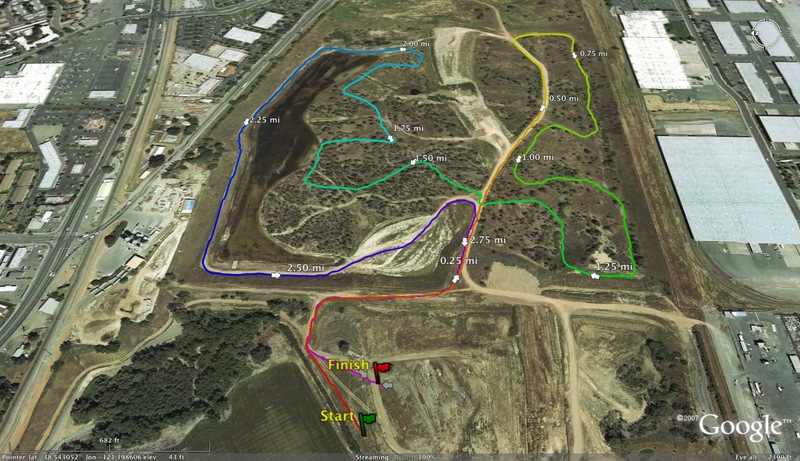 Favorite xc course? Favorite xc invitational? 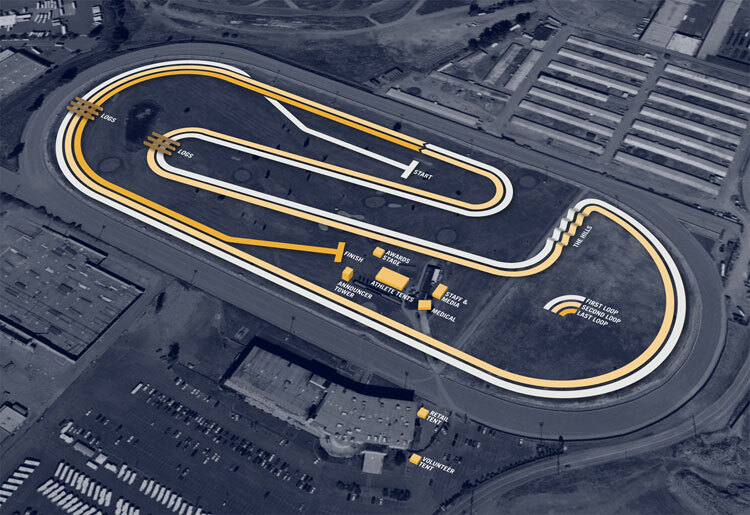 Favorite track distance? Favorite track invitational? Favorite opponent(s)? Anything back in Castle Rock Park is great. 2-mile repeats. 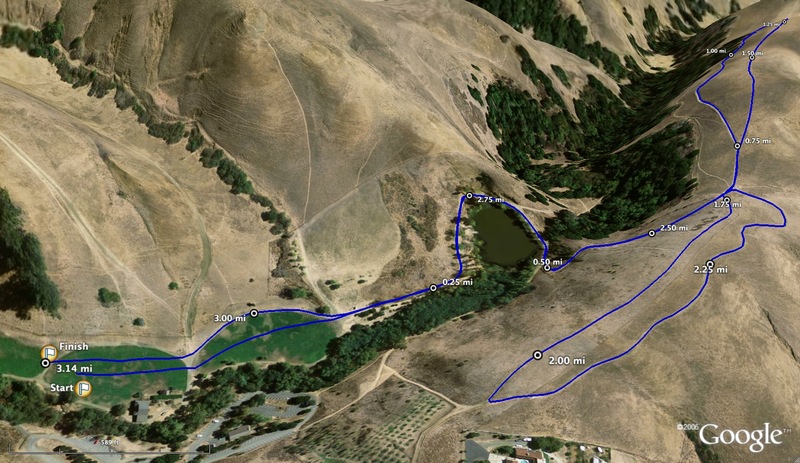 4 2-mile repeats or 6 mile repeats (in the hills). The state course. The state meet. 3200. The Dan Gabor Distance Festival. Aidan Goltra. 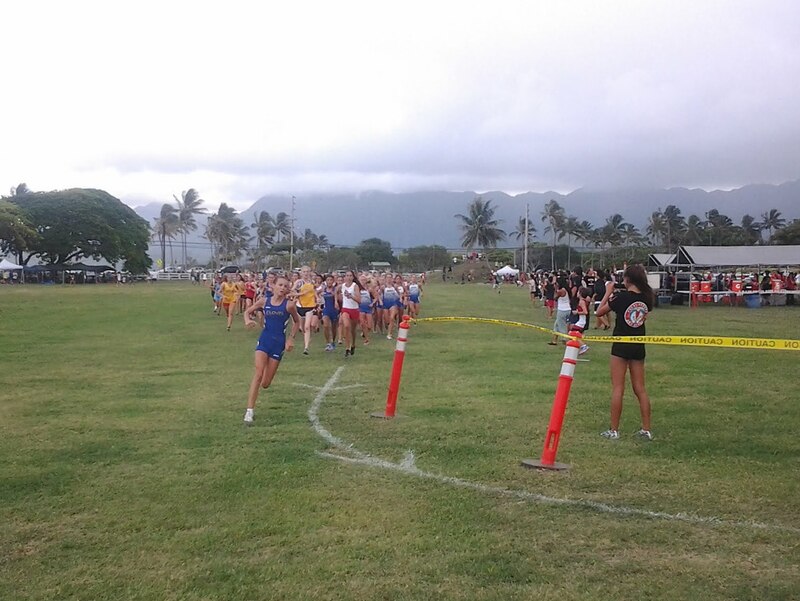 11) Your team just ran at the Iolani Invitational in Hawaii. Tell us a little about that trip and what were some of your highlights? I think the most satisfying thing of the whole trip was doing so well as an invitational, but certainly the most fun part was hanging out with the team and running around Diamond Head in the mornings. If you would like to see an athlete or coach interviewed on this site, please let me know by email at albertjcaruana@gmail.com or you can mention them in the comment section below. Results for Arcata HS which traveled up north to win the girls' division and place second in the boys' race. The Hawaii trip was all that could be expected, and then a little more. Aside from the fabled Hawaiian hospitality, gorgeous weather, and remarkable beaches, the races were exciting too. The girls' varsity race turned out to be a barn-burner, as the highly ranked Dana Hills (D-I) and Palos Verdes (D-III) teams were clearly aiming at each other and promising to turn the event into a dual meet. Clovis came along with other ideas, and was a strong factor as well. Palos Verdes turned the race around with a strong 2nd half surge after Dana Hills looked in charge early, and Clovis was just a notch behind those two in the final team standings. San Jose's own Lynbrook High took 5th. Wonder-frosh Mikayla Sodersten of Clovis (pictured above) tore to the lead early and then ran away from the race for a very impressive win. Local junior Dakota Grossman (Seabury Hall, Maui) gamely gave chase and was only outsprinted at the end by Palos Verdes' Cassidy Webber. NorCal representation in the top 10 came via Lynbrook's Grace Ling in 6th, and Northgate's Ami Boucher in 7th. The boys' race didn't appear to have the same pre-race drama, as Palos Verdes was a clear favorite for the team title, with Clovis willing to give them a chase. It turned as anticipated with PV putting on a classic clinic in pack running with their top 4 (places 2-3-4-5) in a :07 grouping with # 5 only :30 back of that. Clovis was only a slight phase shift back and also had the team pack idea well-rehearsed. Their top 4 (places 7-8-9-10) were within :16 of each other, and #5 :40 back of that. Lynbrook again showed up near the top of the team standings with a 4th place in this race. Danny Stalters of Northgate added some NorCal luster to the proceedings with a clear win. 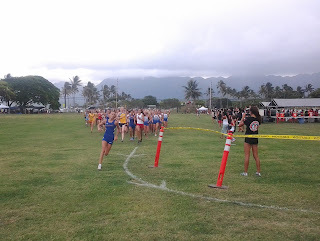 The race stretched out at about the 3/4 mile with, with Stalters leading the PV pack at that point and the Clovis pack and local runner Davis Kaahanui of Kamehameha a gap behind. 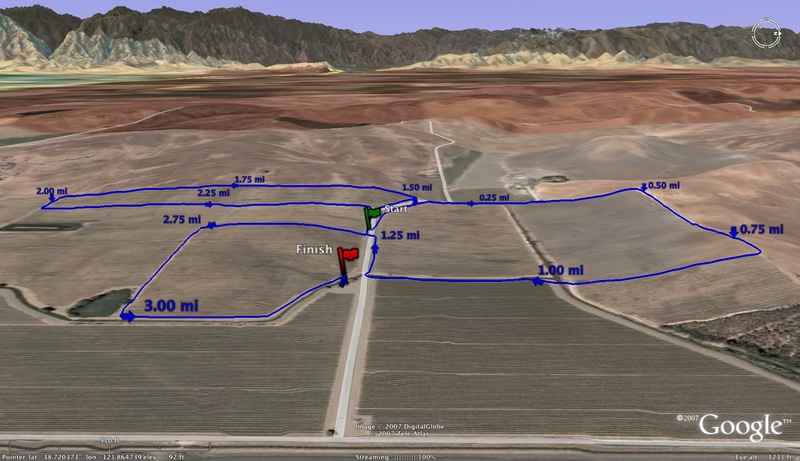 The race essentially stayed that way for the next two miles to the finish. There was some coach discussion post-race that the actual race distance might have been a bit longer than the posted 3.0 miles, as the humidity and terrain were not considered strong enough factors to account for the times being a tad off expectations. But then again, that was probably just idle coach talk. The Iolani school did a bangup job on the meet organization, especially in welcoming their mainland guests. 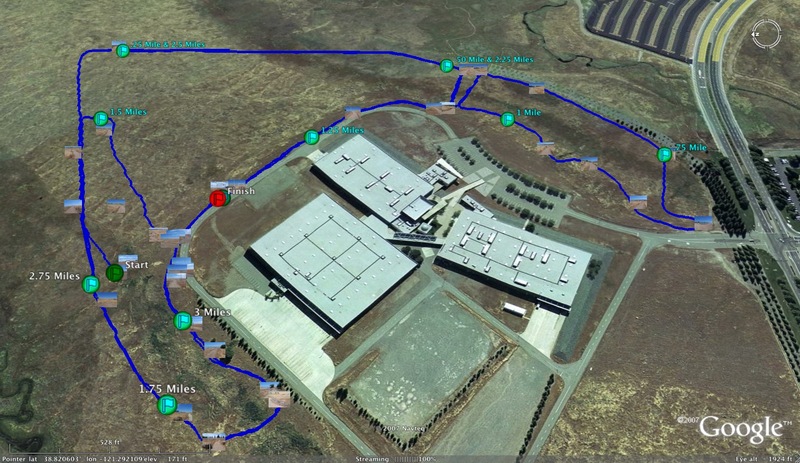 Especially impressive was their huge Sports Med complex right at the finish line to take care of runners. Luckily, the races were held in the late afternoon/early evening, and the light breeze helped too, and there were no medical emergencies so dire that ice, water, and rest couldn't deal with it. 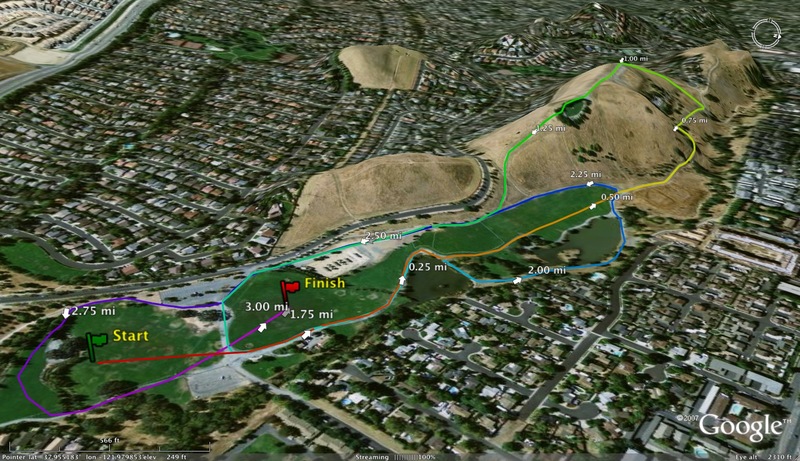 Josh Ruff Memorial Trojan Invite, (SJS) NEW Results now posted. Woodbridge Invitational, Woodbridge HS (SS) Las Lomas and Sacred Heart Cathedral. More will be posted during the day as I find them. Any links, send them to albertjcaruana@gmail.com and I will post them. For those of you wondering what the course record is at the Half Moon Bay HS course, here is German Fernandez below about to break it in 2007. 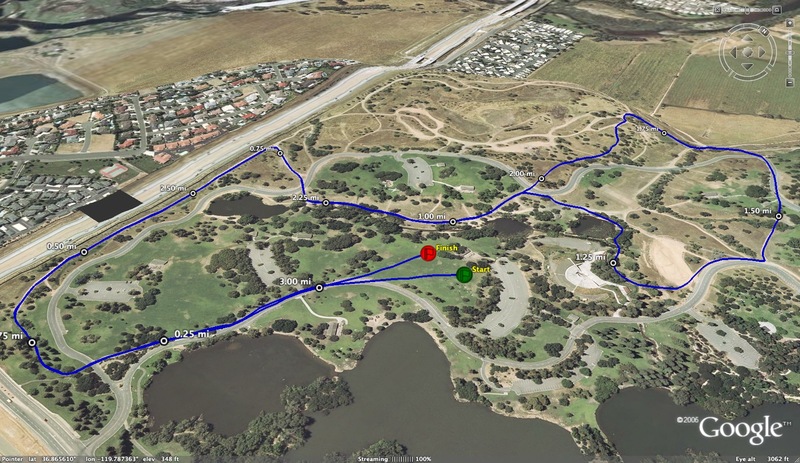 Unfortunately the original course which stayed the same from 1971 to 1998 had to be changed a couple of times due to school construction to it's current version. Please share below in the comment section. You may use your name or not. What do you want to accomplish this year? What have you done this summer to accomplish those goals? Are you a coach? What are your goals for your team this year? Best of luck to everybody on a successful season! 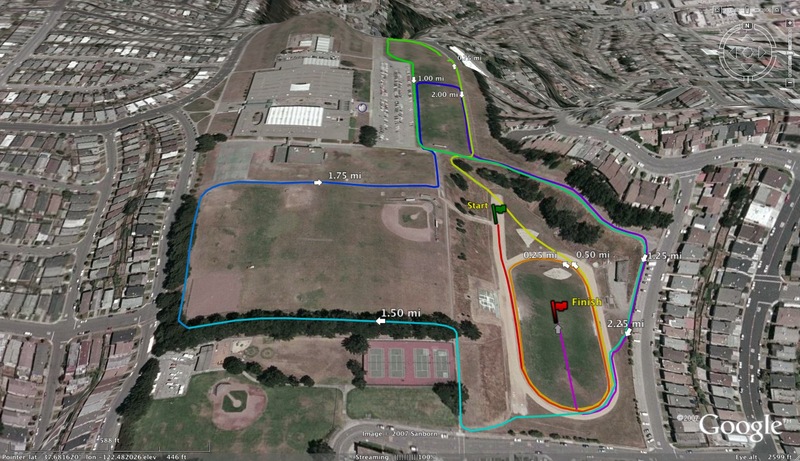 Cougar Classic, Upper Lake HS (NCS) Cancelled due to unhealthy racing conditions. If you have other results or links to other results, send them my way at albertjcaruana@gmail.com. The Sizzle is a little bit different than most XC Invites…each school is allowed an unlimited number of 3 person relay teams. The relay is a 3 x2.8 Kilometer race. Team scores are based on the finishing place of each school’s top three teams. By our standards, the Sizzle was very un-Sizzling…race time temps were in the low 100’s!!! Last year, at the start of the race, the temp was around 113. Beaumont looked very strong on the boys side, with their top relay team smashing the course record by about 90 seconds. An additional 4 relay teams dipped below the previous best mark (held by Bishop Amat @ 29:18.25). Teams two through five were separated by less than 2 seconds…which is pretty remarkable to think that 4 different teams of 3 athletes could traverse the course in almost identical times. Beaumont took first, followed by Xavier and 29 Palms. For the girls, the XCP relay team finished first thanks to a dominating anchor leg by our number two girl, Meg Lizza. Going into the third and final leg, Meg was almost 30 seconds off of first place, as we pulled in behind both Bishop Amat and Beaumont. Meg scorched her home course to finish almost 19 seconds ahead of the 2nd place team…a turnaround of just under 50 seconds! Our number one runner, Valeria Ruiz, ran anchor for our B relay team and finished with a split of 10:58 over the challenging course (which I believe to be an individual course record for the girls). Overall, the depth of the Beaumont team got the better of us on the girls side, with their C relay team outpacing ours to assist them in the Girls Varsity victory. Xavier placed 2nd overall, with Palm Springs 3rd. Course records fall at the 29th Monte Vista Invitational! Pianin and Stalters set new marks. The seniors led the way today with strong performances from both the boys and girls. In the Senior girl race, Amador Valley's Jena Pianin (pictured) smashed the existing course record by over 9 seconds with her 12:14.4 clocking over the hilly two mile course. Sr Mary Ann Gong of Granada was second in a solid 12:46 effort. Three freshman were in the top 5 overall times, with Monte Vista freshman Brooke Starn running the second fastest time on the day (12:44) with Fr Megan McCandless of Granda and Chloe Hansel close behind. In unofficial scoring (no team scores kept), the Las Lomas girls looked to be fasted on the day, followed closely by Monte Vista, Granada and Amador Valley. On the boys side (pictured below), seniors dominated - taking the top 11 times on the day. Northgate senior Danny Stalters pulled away from Washington's Nolan Peterson to take the overall honors in a new course record time of 10:37. Nolan also got under the previous record of 10:44. San Ramon Valley had the fastest team time on the day, with 4 runners in the top 10 and their 5th in the top 20. Acalanes, Miramonte and Amador Vallley were next in line. On the day, 1164 runners finished the course from twenty area teams. If you have other interesting links, send them to albertjcaruana@gmail.com and I will post them.